View over Alnham. Photo by Harry Rowland. The parish of Alnham lies on the south-eastern edge of the Cheviots. 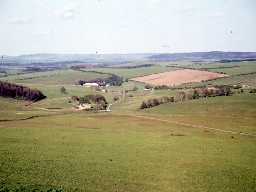 It stretches from the lowland areas around the village of Alnham to the uplands to the west of the parish. It borders Scotland at Cairn Hill and Salters Road, one of the old routeways into Scotland went through the village. The western uplands are rich in upstanding remains of all periods from the Bronze Age through to the post-medieval period. Prehistoric field systems and medieval and later shielings and enclosures show the importance of agriculture in the area. In the lower areas to the east medieval remains dominate. There are several deserted or shrunken villages, and the sites of at least three peel towers are indicators of the village's position on a troubled border. Although there may have been earlier inhabitants the first evidence we have for human activity belongs to the Bronze Age. This is mainly found on the upland areas, where their burial cairns survive best. They undoubtedly lived on the lower lying land as well, but thousands of years of ploughing have destroyed any upstanding remains they left. However, occasional traces of their burials, such as the grave with a pottery vessel have been found. It is only in the Iron Age that the first settlements are found. These mainly consist of small groups of round houses with associated field systems. These fields are usually marked by long earth and stone banks, but piles of cairns built from stones removed before growing crops are often a good indicator of the presence of fields. In some cases even traces of the prehistoric ploughing itself can be seen, leaving a slight pattern of furrows known as cord rig. Many of these settlements were surrounded by simple earth banks. Some sites, such as the hillfort at Castle Hill were more extensively fortified, and dominated the surrounding landscape. The Iron Age style of life seems to have continued throughout the Roman period. The parish is well to the north of Hadrian's Wall, and the Roman conquest seems to have made little difference to daily life. This may explain why the few Roman remains are so similar to Iron Age settlements. Like many villages in Northumbria the early medieval period is an almost complete blank. There are slight hints that the Church of St Michael may have been founded in the late Anglo-Saxon period, but it clear that the main structure belongs to the later medieval period. It is only after the Norman Conquest that once again we can recognise the remains of the past in the parish. Alnham was just one of several villages in the parish, including Unthank, Upper Prenwick and Great Ryle. As well as lowland farming, the presence of small medieval settlements in the uplands suggests that in the summer the sheep were taken to higher pasture, and the shepherds lived in these shielings. There is also evidence that there was some more permanent settlements existed higher up than the modern villages. The parish's location in a border region affected its history. The church may have been laid to waste by William Wallace. The fortified tower near the church may date as early as the 14th century, and may well have been built to afford protection from raiding Scots. In later period trouble came as much from local outlaws. At least four tower houses are known from the parish, and indicate the moves made by the locals to protect themselves . The troubled nature of the area in the later medieval period may be one of the reasons why so many of the settlements in the area went into a decline, though other economic causes must have played a part. The decline in lowland villages must also have been related to the decline in the upland shielings and steadings. The old Salters Road had been an important route into Scotland for merchants carrying salt north, and farmers bringing cattle south to the English markets. Several wayside crosses may have marked the trackways north. 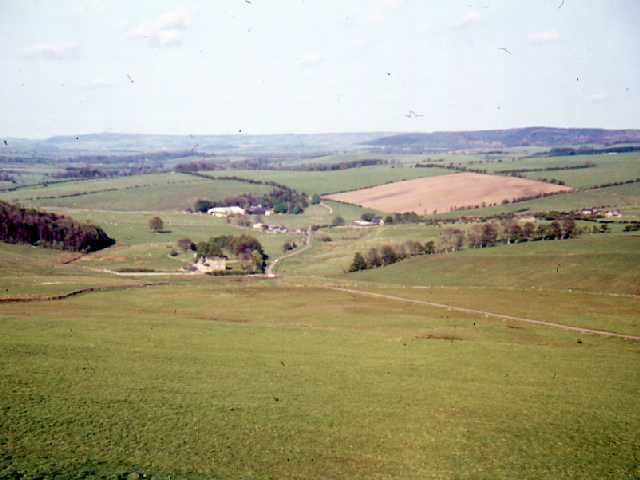 However, with the growing peace in the Borders region, and the decline in agriculture Alnham became increasingly quiet. Unlike some parishes in the area there was little new building of farms in the 18th and 19th century, one of the few examples being at Pennywells. This may be because the parish was owned by the Duke of Northumberland, rather than several smaller landowners, who would have been more likely to construct farmhouses and buildings locally. Alnham is now a small hamlet, and a gateway to the fine walking available in the National Park.